I have a dim memory of blue being the only other color than white on some of the old frame farmhouses I recall from childhood. By the time I painted my own I realized that it must be some sort of tradition but I didn’t know any more than that. At some point I began to think that the reason must be what Ray wrote…that the color mirrored the sky. This appeals to me from an artistic standpoint. On Wikipedia I learned the color is actually called “Haint blue”. It is believed to have originated with the Gullah people of South Carolina. They believe that the color will prevent evil spirits (haunts) from entering your home. In the Hoodoo belief, “haints” are witch-like creatures that will chase their victims until they die from exhaustion. Some think the “haints” are confused by the blue thinking it either the sky or water. Spirits will traditionally not cross water. Originally the color was made from pigment obtained from crushed indigo plants which were grown on plantations. The tradition has survived long after the indigo plants have disappeared. The Gullah painted not only their porch ceilings this color but also shutters, and window and door frames. Additionally some people believe that the color repels insects. This may be a holdover from when milk paint was used that contained lye. With this new knowledge gained, I like the color even more. The blue I chose for my porch ceilings is a little darker than theirs. Kind of like the color of the sky before a storm. I think I’ll lighten it up a bit. They need painting anyway. PS. I wonder how many pale blue porch ceilings we have in Maplewood? Obviously, this ain’t Maplewood. 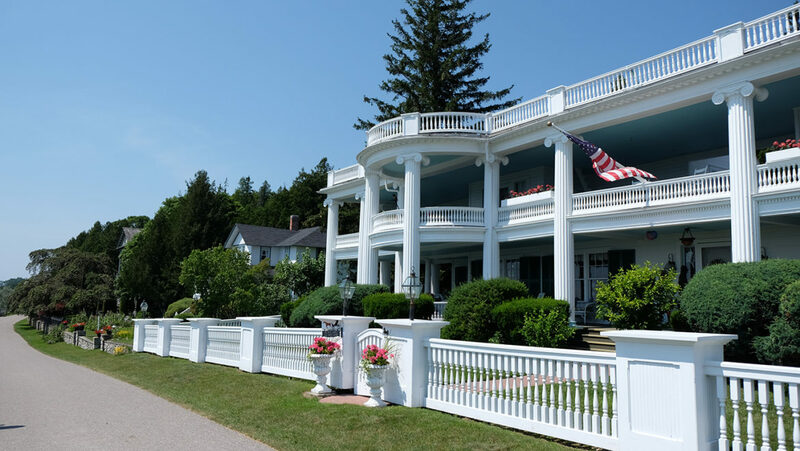 This home with the blue porch ceiling is on Mackinac Island, Michigan. All right, Quinbus. Yours is number 8. I seriously am going to repaint mine. Sorta skyblueish is exactly what I’m thinking. No haints is reason enough. But no Hymenoptera as well…my course is set. Thanks Q! I’m on Oxford and have had a blue porch roof for over 40 years. Mine is somewhat darker than the haite blue but I like it better. Reminds me of the sky color in Colorado. My next door neighbor used to have a pale green porch roof but it became white during the last painting. Good to hear from you, Peter. Yours is number 7. Do you think your neighbor is aware of the risks he’s taking? Our shiplap porch ceiling in Richmond Heights is currently white but needs to be replaced – now I know what color it will be! Way to go, flatflo. Plus you’ll have the added benefit of no haints and that’s not nothin’! Mine on Cherry is painted forest sky blue. Hi Mary, Forest sky blue? Is it a blue-green? Several of the recommended colors from the paint manufacturers are. With Mark’s 3 known examples in Maplewood, my 2 and your 1 we are up to 6. Surely there are more than that. I’m going to pay more attention on my walks. When I was a kid, many people painted their concrete front porch steps red. I have no idea why. For a long time we didn’t. Then I was sent to Melcher-Schene Hardware at Natural Bridge and Shreve, for a can of red paint. I think it might have been specially formulated for use on concrete. And I got to do the painting. Red front steps? I wonder if that’s a tradition wider than your neighborhood, Tom? Needs a little research. Thanks for your recollection. I googled ‘Tradition of painting front porch steps red’. Found nothing. What came up was painting your front door red. Means good luck if you’re Chinese or that your mortgage has been paid if you’re Scottish. So I guess if your ancestry is Chinese/Scottish you can kill two birds with one stone with a can of red paint. I painted my back porch red. First I painted a couple colors of undercoats matching fall leaves. Then I taped down leaves and painted around them so that I have a red porch with leaves. That was a long time ago so the porch is getting to a point of needing repainting. We also whitewashed the trunks of trees in the curb lawn. I think I once knew why, but it escapes me now. Anyone? It is for bark protection and to increase fruit yields. I’m serious. I googled that too. I know of one on Loymeyer and one on Oxford. Did not know of the thought of haints but had heard often that the mud dauber wasps won’t build a nest there because they think it is the sky. Who knows what a wasp thinks! just remembered another one on Richmond. I seem to remember one of the major paint brands, maybe Benjamin Moore used to have a blue that was something like plantation ceiling blue or southern ceiling blue. Something along those lines. Hey Mark, I checked the color lineups of Benjamin Moore and Sherwin Williams. As you might expect neither had either of those names but both had several different shades of blue recommended for porch ceilings. I don’t doubt that sometime in the past the names were similar to what you remember. So you know where three of them are in Maplewood. I have two. That’s five.